The CEF collects feedback from participants on the usefulness and impact of our learning initiatives. We showcase the skills and knowledge that finance officials across South East Europe acquire as a result of attending our learning events, and to reflect on how these benefit their work, as well as their teams and institutions. This is done by quantitative evaluation with carrying out post-event surveys that measure participants’ reaction to the learning experience (general assessment and impressions of the event, delivery, faculty and organization) and learning effect with respect to increased knowledge (usefulness of the event, achievement of learning objectives, and likelihood of future application of gained knowledge). We also do qualitative evaluation with collecting the so-called Value Creation Stories. We are using adjusted Wenger-Trayner value creation conceptual framework that shows how a change in behavior traverses different cycles, providing an account of how learning initiatives have created value for participants, their organizations and stakeholders. These stories illustrate the link between our learning initiatives and the impact on our beneficiary institutions. The cycles of value created are explained in more detail in the graphics below. Qualitative data are important for measuring changes in practice, fresh collaborations, and application of new approaches. 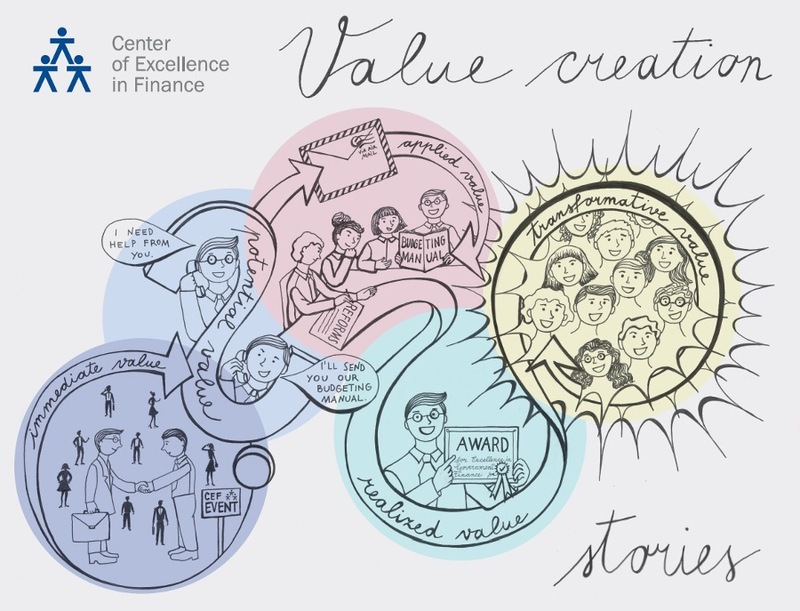 The value creation stories are collected on our website under the section Voices from the Region. Graphic presentation of value creation cycles. Starts with describing the immediate values: sharing experience, meeting others, sharing similar challenges, etc. Continues with outlining the newly created knowledge capital: inspiration, new insights, new methods & tools, new connections, etc. Explains any application of it to solve a specific challenge: change practice, start a new collaboration, apply a new method, etc. Finally, the learning experience may link to actual performance changes that are meaningful to participants and their organizations: improve personal or Ministry performance in area of budgeting, etc. And may inform a redefinition of performance or reconsideration of strategies, goals and values: possible transformation in the way things are done.